Why was it actually abandoned? Birkenhead was against it because of the ferry but that doesn't make sense. Did Birkenhead control the ferry? I know Wallasey, Bootle and the trains were not happy but who actually put the spanner in the works? "As you can see, the Tunnel is circular. The roadway occupies the top half. The bottom was intended to be for a train or electric tramway, but that never happened." Last edited by mikeeb; 4th Aug 2016 11:21pm. I've been in the bit under the roadway (the bottom half). It's full of pipes and wires but could be turned into a second deck or a railway line. I don't know why the trams never ran: possibly Liverpool and Birkenhead couldn't reach agreement. The ferry was always the Birkenhead ferry, from when the initial charter was granted to the priory by Edward 3rd. in 1330. The ferry was eventually taken over by Birkenhead Corporation in 1858. You would think company's on both sides of the river would have been all over any new venture. were they more tightly regulated back then? 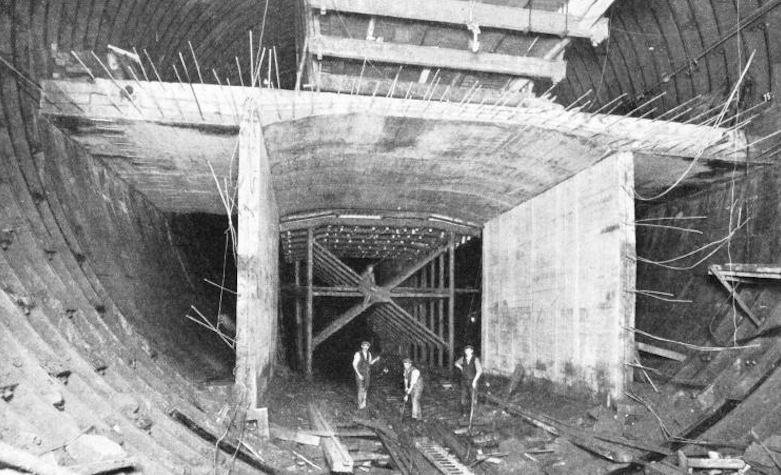 Regardless of whatever the regulations were back then, any form of public transport travelling through the tunnel would have raised objections from the ferries and the railways. The original plan was to have trams. Quote from "The Story of the Mersey Tunnel, officially named Queensway"
"In this, the original scheme, through tram services between Liverpool and Cheshire boroughs were a prominent feature. It was for that reason that the great diameter of 44 ft. was provided for throughout, except in the branches, a diameter sufficient for four lanes of traffic on the upper deck and two sets of tram rails on the lower". The tram plan seems to have been abandoned at the same time as the Wallasey and Bootle tunnels were. there is a vague reference to "Birkenhead's opposition to trams" but I cant find any reason for that, although it could have been because of the effect on the Birkenhead owned ferry. "One was opposition from Birkenhead who wanted to protect their Ferries, another was that the government had said that they would reduce their contribution if a tramway was laid. The Tunnel would however still be excavated and built for most of it's length with a massive space under the roadway designed for the Tramway." So it was down to money. When isn't it? Did they cover the road surface with these tiles and how long was it before they recovered with an alternative surface? Yes, the cast iron tiles were about a foot square with a studded surface and they were set in a bitumen compound. I don't know when they were tarmac'd over. There's a good picture of them being laid in the book "The Story of the Mersey Tunnel, officially named Queensway". You used to be able to buy this book for �5 at the tunnel HQ. It's a facsimile reprint of the original which was published for the opening in 1934. It's the most comprehensive book on the tunnel that I know. asked the Minister of Transport whether he has received any reports on the success or otherwise of the experimental iron roads, particularly with regard to the safe use of them by solo motor cyclists? The reports which I have received on the experimental lengths of iron paving laid in different localities indicate that the material is generally satisfactory, but I shall be very pleased to receive any reports from motor cyclists, who have not made any special representations to me, or, indeed, from any other road users. I guess this space is now stuffed with pipes and cables and no longer usable for transport. I always thought travellators would be a good way of putting it to use. Expensive perhaps, but think of the advertising space it would provide. I'm sure that would pull in a good income. They seem slow, but gain by the fact that you don't have to wait for the next tram/bus/ train so they end up being a surprisingly good way of moving large numbers of people quickly.